Spacecraft to the moon—check. Oscar—check. Anti-Semitism—check. 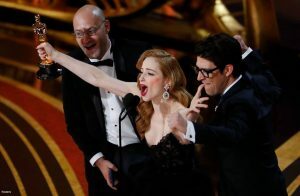 Israeli pride was on full display this week: marching up the red carpet to receive an Oscar, and sending a spaceship to the moon. As usual, the Jewish mind continues to make breakthroughs in science and culture. Good for us! Really, well done! But humanity expects more of us. Humanity expects us to give it the unique product that only we can produce, the product that is deeply embedded in the Jewish DNA, and is the most necessary for human life on the planet right now: the wisdom of how to connect people. Depression is increasing worldwide. Many countries are battling political, economic and social crises. The material abundance that exists is distributed very unevenly. Labor security is undermined; governments are zigzagging; waves of immigration are blurring peoples’ sense of identity while fueling racist and violent movements; alliances that have shaped the West since World War II are collapsing. Technology has turned the world into a small global village, but has also created a web of interdependence that necessitates us to coexist. In potential, we have everything, but in practice, there is one thing missing: good human connections. Everyone agrees that unity is necessary, but no one knows how to mend the broken pieces. According to the wisdom of Kabbalah, the nations of the world expect us, Jews, to set an example for a new social order based on connection and unity. Whether consciously or not, they have a deep-seated demand from the Jews to lead such a way of life. “The Israeli nation had been constructed as a sort of gateway by which the sparks of purity would shine upon the whole of the human race the world over.” Baal HaSulam explains in the article “The Mutual Guarantee,” where he describes the nature of the connection between Israel and the nations of the world, “until they can understand the pleasantness and tranquility that are found in the kernel of love of others”, he said. Therefore, every moving film, every life-saving drug development, every brilliant technological innovation – ultimately do not satisfy the world’s inherent demand towards the Jewish people. In fact, the Jewish success may escalate the outrage. The fact is that even after Israel won first place in the Eurovision song contest, successfully launched a spacecraft to the moon and won the Oscar for best short feature film, an airplane captain told an Israeli worker at Ben-Gurion airport: “I do not shake hands with a Jew,” reminding us that anti-Semitism is alive and kicking in 2019. Now is the time to use all that Jewish genius to kickstart a human revolution that will generate enhanced connection, and facilitate reconciliation between people at all levels of human society. When we work towards unity – every song we sing or film we shoot will penetrate the heart of the world like an arrow. And when humanity takes the littlest step toward this new level of human connection, they will shower us with love and appreciation in return.